This place of mine feels a bit like the chocolate-almond-breakfast channel because those things have got to cover at least three-quarters of what I do here! Well, I've got two of those beloved themes going on today. No chocolate but plenty of almond goodness for a breakfast. Since I do love anything almond-flavored, toasted almond French toast is something I'd definitely be interested in ordering if I saw it on a breakfast menu. Since I haven't seen it on any restaurant menus recently, it's a good thing I can just whip it up at home. This is simply French toast with an almond twist. I spotted a recipe for it from Gale Gand's Brunch but in the book, it was more of a decadent recipe, calling for cream, whole milk, and more sugar than I'd typically use. So I took the basic idea and just applied it to my usual French toast framework. No cream, I stick with low-fat milk, and dialed down the amount of sugar (since we know we'll be dousing our French toasts with a good amount of maple syrup, after all). Rather than using ciabatta bread per that recipe (great idea but I didn't have it), I used standard white bread (I grabbed what I had on hand but if possible, a thick bakery-style white bread is what I like). I know you don't need me to tell you to go with that challah or brioche, or whatever you like for your French toasts. A touch of almond extract in the custard and the flakes of sliced almonds on top will get you to this simple toasted almond French toast for breakfast. If you're like me and at all wondering if those almonds are really going to stick to the French toast slices, I can tell you they do. I really like the toasted almonds on top of this French toast. You get a little crunch against the softness of the bread for a great texture. To affix that almond topping, it takes about 2 tablespoons of sliced almonds per piece of bread like you see here. Lay the almond slices on the griddle in an evenly spread single layer roughly in the shape of the bread you're using. Then, carefully lay the soaked bread on top and let it cook so that the almonds toast and everything sets. Flip and finish cooking until golden brown, warm, and delicious all round. Next time you make French toast for breakfast, consider a simple toasted almond version like this one! In a shallow dish, lightly whisk eggs with the milk, sugar and extracts. Heat a griddle or non-stick pan over medium-low heat. To cook each French toast, grease the griddle and place a single, even but densely-packed layer of almonds in the approximate shape of your bread on top. Soak bread on both sides with the custard then place on top of the layer of almonds. Lightly press down. Cook to golden brown, about 3-4 minutes. Carefully flip the slice of bread over and cook the other side until golden, another 2-3 minutes. Repeat with remaining bread. Serve immediately while hot. I feel like i had something like this at Sarabeth's once...and it was life changing. MUST make it at home!! Joanne, I can pretty much promise you my version here won't change your life *but* they are an easy way to put a spin on your French toast at home. ; ) I've been to Sarabeth's (in Tribeca) for brunch...such a lovely airy space. I think everything tastes better in that room alone. I wish I had a plate of this for breakfast this morning! 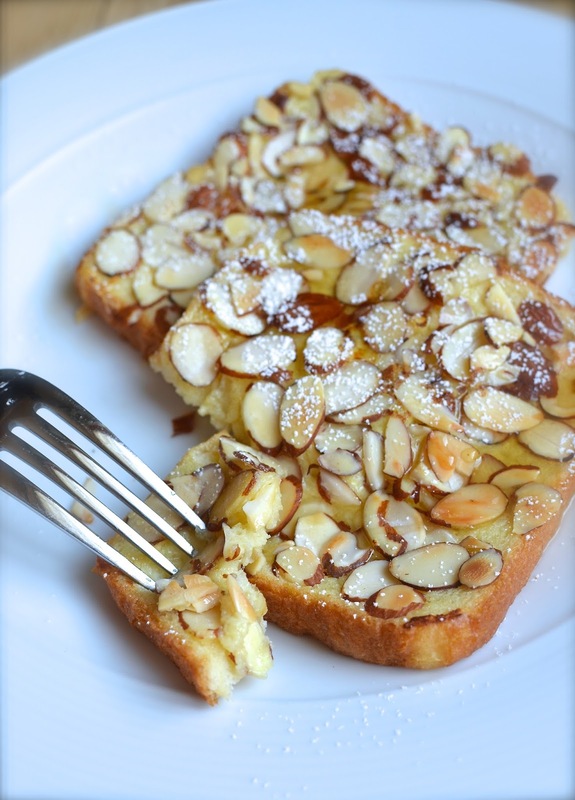 The toasted almonds look sensational on your french toast! The little crunch combined with the soft toast sounds like such a wonderful treat! The little crunchy toasted almonds on top totally get me! : ) Have a nice weekend, Kelly! I must make this SOON. Why didn't I think of coating French toast with my favourite nuts? They look utterly delicious. Your French Toast looks amazing! I'd love to try it. That Gale Gand cookbook is terrific - thanks for reminding me to pull it out again. Yes, pull that book out! : ) So many great recipes all hanging out in our house already that we can't get to...Have a good weekend ahead! You know I would love this - we could absolutely cook for each other - and enjoy every bite. Maybe I can find someone to make this for me on Mother's Day! Beautiful Monica - have a great weekend. You would be getting the short end of the stick with such a proposition, Tricia! I could just imagine being a guest in your house. : ) I do hope you have a lovely Mother's Day coming up - you deserve this toasted French toast and a whole lot more! Absolutely gorgeous! I should try this. Hi Balvinder! Glad you like it - very easy so worth a try on a lazy weekend! Wow - high praise. Thank you! haha ; ) Have a great one, Dedy! Yum! I got requests of French Toast for breakfast all the time! Can't wait to try your version! Love the almonds on top for a nice crunch. Thanks, Amy. The almonds are a nice little twist that's really very simple to do, as it turns out. I love breakfast - thanks, Asmita. I can't wait to try this recipe. I just love almonds and the crunchy topping is just perfect. It is so pretty and almost looks like something you would get in a very fancy restaurant. Well at least if I put some big hints around Mothers Day maybe I could enjoy this delicious breakfast in bed. Wishing you a happy Sunday! Awww...thank you for that! Your dad's French toasts must have been amazing. What a great memory. French toast has never looked more so gorgeous and probably never tasted as delicious either. This is brilliant! We use it on cakes and muffins all the time..why didn't I ever think of french toast!